These super moist hummingbird cupcakes are light, full of pineapple, chopped bananas, pecans, cinnamon and spices topped off with a sweet cream cheese frosting. Instead of cupcakes, you can also make this recipe into a classic Hummingbird cake and increasing the bake time. 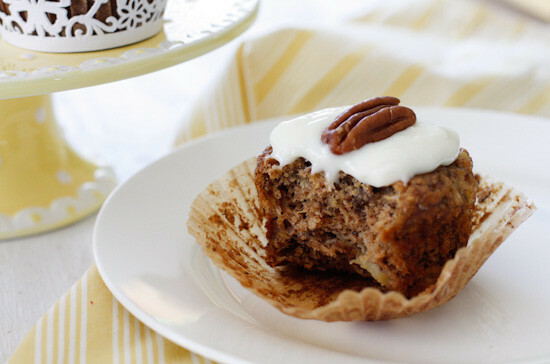 More healthy holiday cake and dessert recipes I love are Maple Pecan Cheesecake Shooters, Banana Zucchini Cake with Cream Cheese Frosting, and Super Moist Carrot Cake. Hummingbird cake first appeared in Southern Living Magazine back in 1978, originally submitted by Mrs. L.H. Wiggins of Greensboro, North Carolina and is known to have won numerous blue ribbons at county fairs. This skinny version does not disappoint! 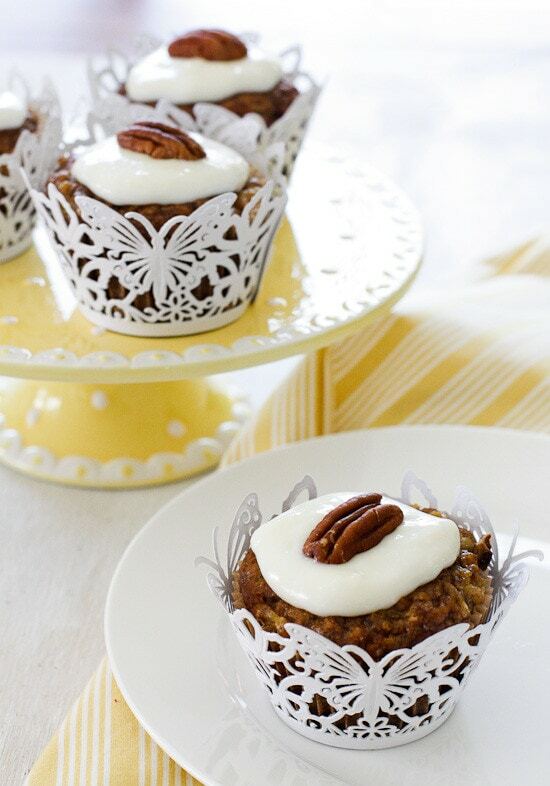 The flavors are reminiscent of a carrot cake, without the carrots and make the perfect Mother’s Day dessert! Preheat oven to 350°. In a large bowl, combine flour, sugar, baking soda, salt, and spices; stir well with a whisk. In a medium bowl, combine oil, eggs, and vanilla; stir well. Add banana and pineapple; mix well. Fold wet ingredients and chopped pecans with the dry ingredients, batter will be stiff and dry but keep folding it and it will all come together. Spoon batter into cupcake tin. Bake at 350° for about 23 minutes, or until a wooden toothpick inserted in the center comes out clean. Meanwhile, to prepare frosting, beat together cream cheese, powdered sugar and vanilla until smooth. Refrigerate until ready to use. Spread frosting over the cupcakes once they are cooled. 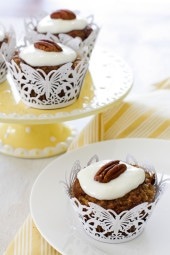 Garnish each cupcake with a pecan half on top. 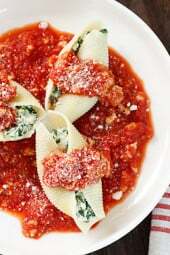 HI, I’ve made this recipes a few times and I love it. Thank you! Last night I decided to give it a go to use up some post Halloween pumpkin puree and it turned out beautiful! I replaced the banana with pumpkin puree and the pineapple with raisins and dried apricots and it worked perfectly. The spices already in the recipe compliment the pumpkin. I made a drizzle for the top using icing sugar, lemon juice and some ginger syrup and it finished it off nicely. Thanks a million for sharing this recipe Gina! These are so delicious!! You probably have all the ingredients on hand already (except for the pineapple), they’re easy to make, and taste like a banana bread muffin with delicious cream cheese frosting. WIN WIN, people! Thanks, Gina! So excited to try these! Because of the cream cheese frosting, do they need to be refrigerated? If not, how long are they okay out at room temp? I’m a carrot cake lover and this Hummingbird Cake is a fun, tropical alternative, I made it in a pretty ceramic 9″ x 9″ cake pan and it cuts into beautiful squares of frosted goodness. I added a bit of finely chopped flaked coconut to the batter – adds a nice bit of ‘chew’ and compliments the banana and pineapple perfectly- and a pinch of salt to the frosting to tone down the sweetness just a tad. Totally addictive!! These were a total flop. I don’t think there is enough flour to cover the wet ingredients and make for a successful rise. They were in the oven for double the time and the interior never baked. Gina- I want to make these for Easter and I was wondering if I could use coconut oil in instead of vegetable oil? Sorry are these 22 full size muffins or mini muffins? Made these for Easter subbing out some of the banana for unsweetened applesauce and mashed mango out of necessity. These were among the best cupcakes I have ever eaten. So moist and delicious! Oh, hummingbird cake is my ABSOLUTE favorite cake ever. Giving these a try this weekend. Thanks for the recipe! I made these without ever having had a full fat Hummingbird Cake before (always been on my to-bake list)…. The recipe was successful. The skinny version of a cream cheese icing was satisfying and didn't leave me longing for my usual full-fat version. The cakes were moist… I just didn't like the pineapple, ha! I would be enjoying the cake and then get a chunk of pineapple and it would just ruin it. That is just a personal preference though. If you like Hummingbird Cake then I'm sure you will love this recipe. As for our house, we didn't quite finish them all off. I plan to maybe use this recipe as a starting point in making a lighter version of my banana cake. What is the nutrition information without the frosting? I have a fresh pineapple at home, can I puree it for use in this recipe? I made these to take to a friends house and they were a huge hit! I was so delighted to find a lower calorie version of a family favorite cake. This recipe didn't dissapoint. I posted it on my blog and linked to your recipe. Thank you so much for an awesome recipe. Great recipe, so tasty, I used less powdered sugar in the frosting. Gina, this is the first dessert I've made from your blog and is definitely a keeper. I love all the recipes I've made so far. Well I apparently can't read very well. I read 2 bananas instead of 2 cups and I did not drain the pineapple and they were still delicious. Served these yesterday for dessert and they were a hit!! I made these last night…they did not turn out at all. The batter was really wet and the did not rise in the oven. Not sure what happened. How would you make these gluten-free? For everyone who is wondering: the freeze and thaw nicely (sans frosting). I have been baking a batch, freezing, and then taking a frozen one to work in the morning. By the time I get to work it is thawed, and perfect for a quick breakfast. Can I just say that I am OBSESSED with these cupcakes. I have made them every week for the past month, and they disappear, what seems like, immediately. I make them in half batches, but bake 12 cupcakes each time — which is nice because then these are only 4 points! A moist cupcake with cream cheese frosting for 4 points? Yes, please. We are making these for church and need to make multiple batches. Would I be able to make ahead freeze these (unfrosted) or would they dry out too much? Made these for Mother's Day and they were fantastic!! Going to try the zucchini/pineapple ones next!! Gina, I cook one of your recipes nightly! My family thanks you!! WOW These are amazing! Honestly even better than they are from my favorite bakery. Only problem is…I can't stop eating them! Next time I'm only making 1/2! I made these for mothers day and they turned out beautifully! I accidentally bought the pinapple chunks rather than the crushed pineapple. After draining it, I ran it through the blender and added it in. It made the batter really moist and I was worried they wouldn't turn out. But they did! Thank you so much for the recipe. These are incredible looking! I just made a lightened up version of Hummingbird cake too. 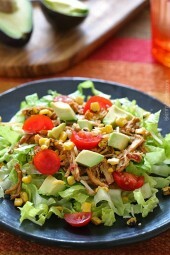 I love it without all the added oil that the original recipe uses. I wanted to update you on the success of these cupcakes (I'm calling them muffins so that I can eat them for breakfast, hehe). They are totally amazing, and I am a horrible baker. I had to make the following substitutions, as I didn't want to go out to the store: walnuts for pecans, EVOO for oil, 1/2 of the sugar was light brown sugar (1/2 white), and grated fresh ginger for powdered. Also, I didn't measure my mashed bananas–I used four of them (looked a bit under 2 cups). I popped it into my calorie tracker (sans frosting–which is amazing, but skippable) and got: Calories 127. Woohoo! THANK YOU! This will be a regular recipe for me. Totally impossible to mess up, and delicious. I'm going to make these then freeze a bunch to use for breakfast. I don't know if these are really meant to be a breakfast item… but they look similar in nutrition to a breakfast cookie recipe I saw recently, so why not! Gina! I made this for mother's day dessert (as part of "made for mom with love theme) and OMG can you say crowd pleaser! Granted was only a crowd of three (mom, hubbs and myself) but of the 2 dozen Im left with approximately 9. Mom and hubby are diabetic so I used splenda instead of sugar and walnuts in lieu of pecans (its what I had on hand) and no FROSTING and may I just say this cupcake stood up to the challenge. Abso-friggin- lutely delish! this is likely my third or thirtieth attempt at weight watchers (this time Im more so counting calories but using WW good food guidelines and weekly meetings) but staying within my point/calorie range while NOT giving up my fave foods is so much more achievable and I have YOU TO THANK! I appreciate you for creating this site and making life so much easier for average gals like me – complete with Ziplist! I flag recipe and update my shopping list. So far Ive made a sweet treat every week since Ive started (on week 5) and up until last week made a slow cooker meal on sunday to get us thru the week. My husband (otherwise a critic) has inhaled everything faster than we can get to Tuesday. Compliments to the chef (and blog owner). You are a gem and I hope you continue to grace us with your site – bc it is a godsend! Thanks again!!! I agree with you Chubbette 150%!!! I do not think Gina realizes how wonderful she is! I have been fighting with my weight ever since I had kids (the oldest is almost 13). I absolutely LOVE to cook and her meals are on my menu everyday. I did WW, now I am counting calories and working out to Turbo Fire and am losing inches like crazy! My family LOVES all of Gina's recipes and I hope she keeps on cranking them out! I have YET to make something that we didn't just love! Gina is DEF a God send! Would the points be less if Splenda was used instead of sugar? Made these for Mother's Day, used pineapple tidbits on accident instead of crushed, but they were still soo good!!! I made them, they were great! Thanks for a wonderful recipe! Where did you get the cupcake holders that are photographed with the hummingbird cupcakes? I think it was Michael's. Could these be made in the mini-muffin tins? What would the Points Count be for a mini-cake? Sure, 2 minis would equal the same. I made these yesterday as an after school treat. I did not make the frosting. They were good without it!!! I never heard of these before. They were really good!!!! This cake is one my Mother would take to church. Our pastor at the time, really loved it. Mother would say she is taking it to the preacher. I'm anxious to try these cupcakes. Can you use Stevia instead of sugar.??? Gina, these look great! What size pan would you suggest if I wanted to make this a cake for Mother's Day and how long should I cook it? you are amazing!!! I was looking for a dessert to make for mother's day brunch and i just found it. thank you! 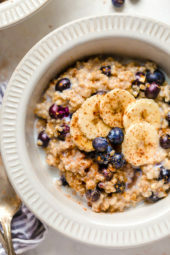 What could I substitute bananas with due to a food allergy? try subing it with sugar free applesauce. Delicious sounding! I can't wait to make them…. And I always use Splenda baking mix when I bake and have had no problems. Or use organic raw sugar…..
Do you know what the nutritional information would be without the frosting? I made this morning and they are SO delicious even without the frosting! Yes making the whole Hummingbird cake is sometimes way too much..this idea seems so much nicer. My mother made it as two loaves of bread..NO ICING..still tasted wonderful.. Thanks! SO delicious!! I brought them to work today, and everyone is raving! I didn't frost them to cut calories and fat, and they are just so moist and wonderful. THANK YOU! Yum! What a beautiful cupcake! I love that there made with fruit! Loving these babies! And what gorgeous liners you have here. Could I use Splenda instead of the sugar and bake it in a bunt pan like I do the regular version and how long would I bake it? Oh, this is what I wanted to ask. Hope she let's us know soon. I want to make this for mothers day. I don't use Splenda, but I'm sure the baking blend would work fine. This looks amazing! It is going on the Mother's Day menu right now! This looked so good that I went right out and bought the ingredients to make it. I can't wait for these to come out the oven…I'll be back with an update. prevents spam which I get a ton of! I'm so excited to try this! I love hummingbird cake, but it will be even better if it's a little healthier. Could I skip the pecans in the batter? My fiancé can't have nuts but I think he would otherwise loveeee this. Thanks!! Sure, they wouldn't be "hummingbird" but they taste just as good. Would you be able to say what the points/calories would be without the frosting and pecans? Thanks! Sure, I think it would be fine, it will just have to cook longer. Wow I cannot believe this. I just made this and was hesitant to make it again b/c I know it's so high in calories. My question though is can I put this in bundt cake form? And just take those 22 pecans and crumble them on top? Would the actual cake itself suffer any from not being used as a cupcake? Yum, yum, yum!!!!!!! These look awesome!!! I was wondering if using maple syrup would make it more richer tasting. because 1 cup of sugar sounds like a lot! I'm guessing I would have to adjust liquids. I love carrot cake so this sounds delicious though. I just made a chocolate banana maple cake and it was healthier and delicious! It sounds like a lot, but it's only about 2 tsp per cupcake, although you can certainly cut it back to your taste. Can you use this recipe and make a double layer cake instead of cupcakes? Sure, but it may require more frosting, or simply frosting the tops only. Random question since I've seen it a lot on other recipes you've posted – would it make a difference to use all whole wheat flour? I wasn't sure if it would just affect the taste or if mixing both kinds helped consistency or something else. In this cake it would be fine! It's usually a taste thing but with all that fruit, you won't notice. Thanks Gina! You are the best!! half of 3/4 of a cup= 1/3+ 1tbsp, right? how hard do you think this recipe would be to halve? It's easier to think in tablespoons, so 3/4 cup is 12 tbsp. Half would be 6 tbsp or 1/4 cup plus 2 tbsp. Yes, I made half for the photo, no problem! How much frosting is on each cup cake. Those look so yummy I may have to try them. Just under 1 1/2 tbsp. The frosting makes 2 cups so you can do the math and divide by 22 to be exact. Gina, these look really awesome. I want to make them but I'm scared I will eat them all, haha. hmm, I wonder! I'll have to experiment and see. Gina! Where can I get those beautiful cupcake liners?? I think it was either Michaels or HomeGoods. THANK YOU!!! I've been dying for some hummingbird cake, but it was tooo many points!! My mom makes the old version, and this is the best cake that ever was in my opinion. I will definitely be trying your version. Thank you so much for doing it! my mother makes this cake every year, i can't wait to try the skinny version! These look just perfect! Can't wait to try them! Love this cake! Can't wait to try this version now. These look fantastic!!! I love the decorative muffin liners! OH my gosh! These look incredible. You're awesome. I'm not a big fan of pineapple. Is there something I could use instead of just omit it? These look SO good! It needs the fruit, maybe use applesauce instead? In my opinion, the pineapple isn't extremely noticeable in the hummingbird cake I've had. This is one of those recipes where the flavors meld together, but you don't really notice them individually. I've never been a fan of pineapple upside down cake, but I LOVE hummingbird cake. Maybe try mandrain oranges or something else that you do like.